How could I let midnight on Halloween pass without a post? 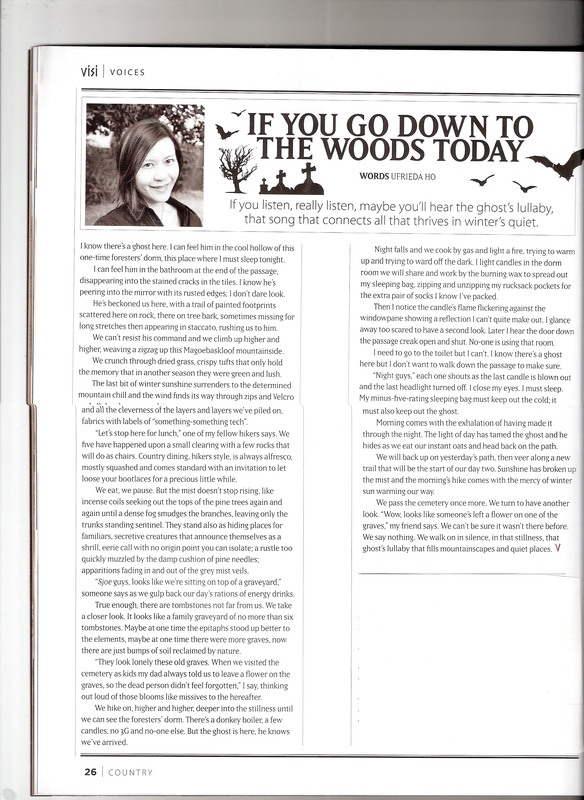 And for this one I thought I’d share a piece I wrote for VISI magazine’s 2013 Collector’s Edition, earlier this year. 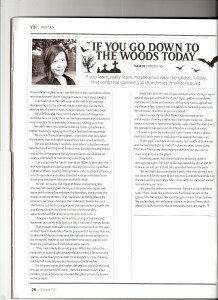 The commissioning editor called and asked if I’d write a piece for their Voices section – six authors were asked to write an essay on a theme. And for the Collector’s Edition the theme was: “Winter in the Country”. It was as wide open as that. In my nine to five as a journo I seldom get to write anything with so much leeway, so what a pleasure to write whatever, without waiting for comment from some official, feigning patience with arrogant PAs and spokes people or running into dead-ends and watching stories ideas go belly up. 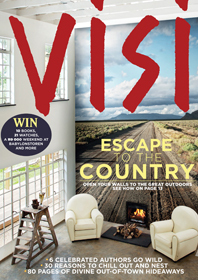 What a treat to write “whatever inspires you about winter in the country”, as the editor said. By chance I ended up in Dullstroom as I started working on my piece – it’s the country by all counts, about 2,5 hours outside of Joburg. Winter arrives here with dense fog to hide all kinds of mystery, wailing winds call out at all night and you lose yourself in the dark, dark heavens lit by smudges from the Milky Way. I typed this story up in the cab of a bakkie, with windows closed to keep out the wind, watching as the dried grass remembered a time it was green and waiting, as one does in Dullstroom, for the flyfisher person in your life, to get a bite. Of course the obvious thing was to write about this scene in front of me, the antithesis of my life in the concrete jungle and the stranglehold of wi-fi, electric fences and road rage that’s part of living in the big smoke. But as I deleted intro after intro I ended up writing this sort-of ghost story … perfect as the witching hour creeps closer to this night of ghouls and ghosts, or as we would say down South – this night for witches disappearing into forests on hyenas’ backs or for the tokoloshes to slip between shadows and maybe slip into your dreams. I can feel him in the bathroom at the end of the passage, disappearing into the stained cracks in the tiles. I know he’s peering into the mirror with its rusted edges, I don’t dare look. He’s beckoned us here, with a trail of painted footprints scattered here on rock, there on a tree bark, sometimes missing for long stretches then appearing in staccato, rushing us to him. We can’t resist his command and we climb higher and higher up, weaving a slow zig-zag up this Magoebaskloof mountainside. We crunch through dried grass, crispy tufts that only hold the memory that in another season they were green and lush. The last bit of winter sunshine surrenders to the determined mountain chill and the wind finds its way through zips and Velcro and all the cleverness of the layers and layers we’re piled on, fabrics with labels of “something, something-tech”. “Let’s stop here for lunch,” one of my fellow hikers says. We five have happened upon a small clearing with a few rocks that will do as chairs. Country dining hikers-style is always al fresco, mostly squashed and comes standard with an invitation to let loose your boot laces for a precious little while. We eat, we pause. But the mist doesn’t stop rising like incense coils seeking out the tops of the pine trees again and again till a dense fog smudges the branches leaving only the trunks standing sentinel. They stand also as hiding places for familiars, secretive creatures that announce themselves as a shrill, eerie call with no origin point you can isolate; a rustle too quickly muzzled by the damp cushion of pine needles; apparitions fading in and out of the grey mist veils. “Sjoe guys, looks like we’re sitting on top of a graveyard,” someone says as we gulp back our day’s rations of energy drinks. True enough there are tombstones not far from us. We take a closer look. It looks like a family graveyard of no more than six tombstones. Maybe at one time the epitaphs stood up better to the elements, maybe at one time there were more graves, now there are just bumps of soil reclaimed by nature. “They look lonely these old graves. When we visited the cemetery as kids my dad always told us to leave a flower on the neglected graves. He said it was so the dead person didn’t feel forgotten,” I say, thinking out aloud of those blooms like missives to the hereafter. We hike on, higher and higher, deeper into the stillness till we can see the foresters’ dorm. There’s a donkey boiler, a few candles, no 3G, and no one else. But the ghost is here, he knows we’ve arrived. Night falls and we cook by gas and light a fire, trying to warm up and trying to ward off dark. I light candles in the dorm room we will share and work by the burning wax to spread out my sleeping bags, zipping and unzipping my rucksack pockets for the extra pair of socks I know I’ve packed. Then I notice the candle’s flame flickering against the window pane showing up a reflection I can’t quite make out. I look away too scared to have a second look. Later I hear the door down the passage creak open and shut. No one is using that room. I need to go to the toilet but I can’t. I know there’s a ghost here but I know I don’t want to walk down the passage to make sure. “Night guys,” each one of shouts as the last candle is blown out and the last headlight turned off. I close my eyes, I must sleep. My minus-five rating sleeping bag must keep out the cold it must also keep out the ghost. Morning comes with the exhale of having made it through the night. The light of day has tamed the ghost and he hides as we eat our instant oats and head back on the path. We will back up on yesterday’s path then veer along a new trail that will be the start of our day two. Sunshine has broken up the mist and the morning’s hike comes with the mercy of winter sun warming our path. We pass the cemetery once more. We turn to have another look. “Wow, looks like someone’s left a flower on one of the graves,” my friend says. We can’t be sure it wasn’t there before. We say nothing we walk on in silence, in that stillness, that ghost’s lullaby that fills mountain scapes and quiet places.